Sunday 14 September was Sustainable House Day (http://sustainablehouseday.com/). It’s a national event where homeowners open their doors to the public to showcase the sustainable features of their homes. Although I was excited to be sharing the project with people, I felt a little sad to have to keep repeating the line, “When the home is officially completed….” almost 3 months after we ‘finished’ the build. Unfortunately I have been in and out of hospital in the past few months and not had the motivation or health to push things forward. This combined with d’Arcy being overseas has meant that things have stalled and we are unable to open the home to the public. I also want the volunteers who worked on the build to be able to spend a night in the home – something I remember many people looking forward to, particularly the Heathfield students. So I’m calling on everyone out there reading this post to please consider if you can help us get the home to final completion. Repair / replacement of the front door that smashed. It’s an odd shape and new glass will be very expensive, so we’re considering perspex, a new door or glass replacement. If you know of someone who has the skills and / or materials to fix the door, please email happysimplyhome(at)gmail.com – all suggestions and assistance welcome. We may also need a blind / screen for this door come Summer, again suggestions and materials welcome. Electrical work – we need to connect the solar panels to the battery system and then connect the lights. Please help to bring this project to a stage where it can be shared. The construction was a wonderful education project but the happy, simply home can’t really be appreciated until the guest book has a lot more names in it. I hope to hear from lots of you in the near future. 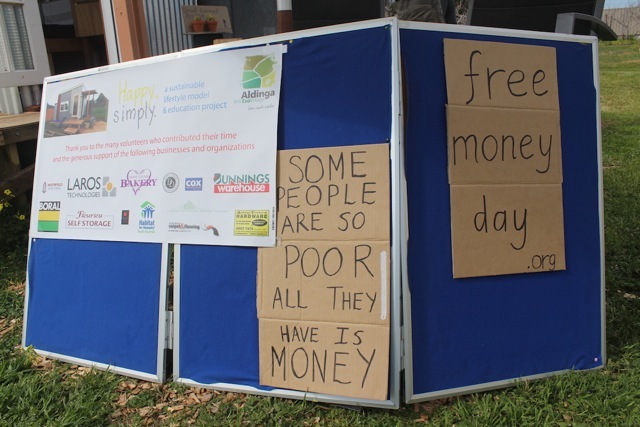 Monday 15 September is Free Money Day – an international event where people give money away to strangers on the street because sharing is fun and to perhaps engage in conversations about money and what it means to us. 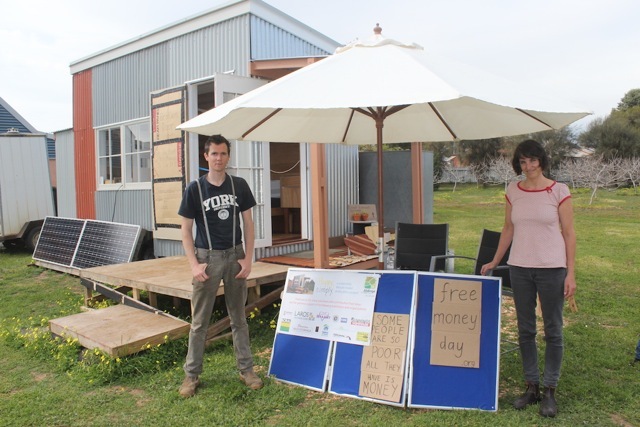 We decided to celebrate a day early and incorporate Free Money Day into Sustainable House Day. We offered people two, one dollar coins. It was an interesting experience and a little weird. I found most people were quite taken aback by the concept and felt very awkward accepting money. Many wouldn’t accept it at all or offered to donate it back, some even wanted to contribute their own money to the pot. I was left wondering if free hugs or free muffins would have been met with the less resistance. Amongst the looks of confusion and scepticism, we did manage to have a few genuinely interesting conversations and brought about quite a few smiles. 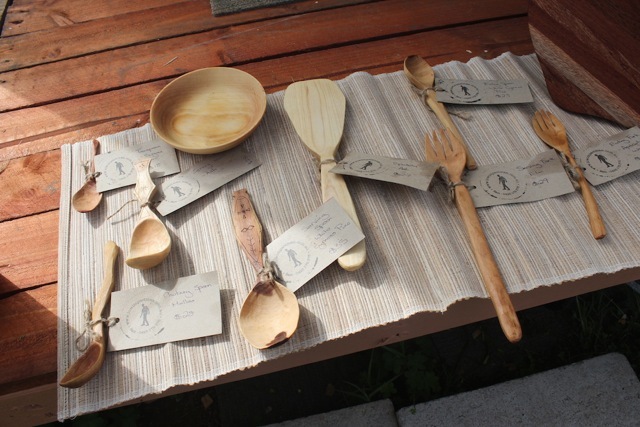 About three people accepted the offering with gratitude and nothing more was said – my favourite response of all. We began the day with $180 and only managed to give away $60. Who would have thought giving away money would be so difficult? Thanks to Amy for contributing to the pot and helping out on the day. Editor note: I can vouch for both of these programs as I have helped design and participated in them often – great perspective and experience makers – Have a go!